Look beyond the hot pot, everyone. Dry pot is the signature item at Sizzling Pot King. You pick the size, sauce and ingredients, then enjoy your concoction, which is served in a dry pot that's heated by a small flame that makes the sauce sizzle. Expect to hear a lot of sizzling at Sizzling Pot King, also a lot of Chinese spoken among customers and staff alike. It all bodes well for this small but expanding chain that does a good job with a broad range of specialties from China’s Hunan region. Hunan cooking relies on chilies but also aromatics like garlic and shallots. 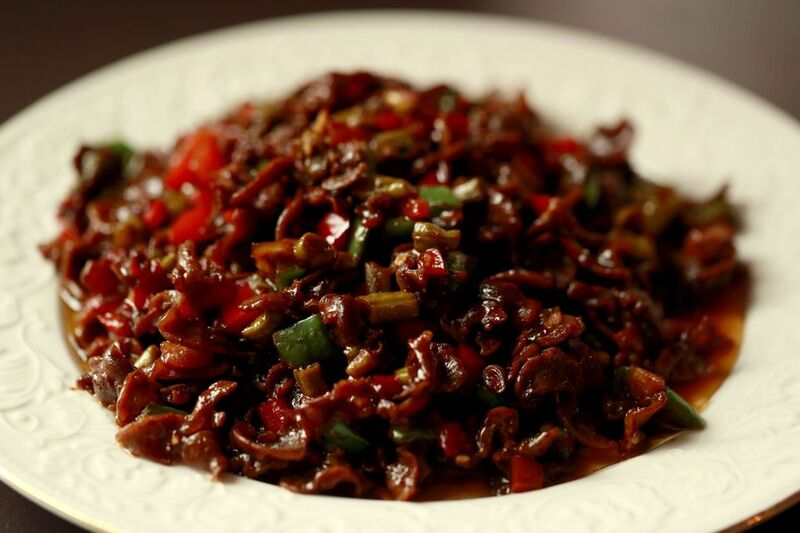 Where Sichuan cuisine tends to be oily and delivers a numbing heat, the Hunan style is drier, the chili heat sharper. 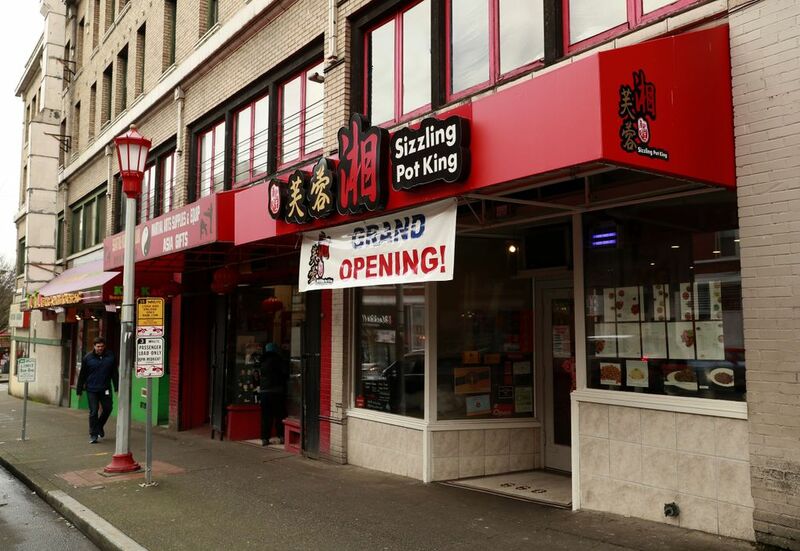 Since its debut in San Diego five years ago, Sizzling Pot King (SPK) has opened six stores, two of them in our area — one in a Bellevue strip mall, another in Seattle’s Chinatown International District. A third will open in Shoreline this month. The restaurants share a bright, streamlined, fast-food look: flaming orange booths, black tabletops and chairs, laminate wood flooring. Striking Chinese ink drawings cover the walls at the King Street spot. Rugged stone accents warm the interior of the Bellevue restaurant. The signature item is “dry pot,” a communal dish that diners can customize any number of ways. Unlike hot pot, it doesn’t involve broth or dipping sauces. Dry pot is self-contained: a variety of vegetables and proteins served in a broad, round, shallow vessel kept warm by a flame underneath that makes the sauce gently sizzle. The kitchen assembles the dish to your specifications. That means you have several decisions to make, starting with the size, and moving on to the flavor of the sauce, the level of spicy heat you prefer, and finally the contents. The restaurant’s heavily illustrated menu and patient staff overcome any linguistic hurdles. The base price ($25.99 and $33.99) includes potato, cauliflower, broccoli, celery and bean sprouts, as well as a choice of marinated meats and seafood that are cooked separately then added to the sautéed vegetables and sauce. Selections get adventurous —beef tongue, pig feet, tripe — but I stuck to the more conventional. Thin-cut beef short ribs and long, meaty pork ribs fared better than chicken chunks, which were predictably dry and chewy. The only practical way to eat the ribs is with your hands. We had already begun to do so when the waiter dropped a box of plastic gloves on the table. Ask for some before you dig in. 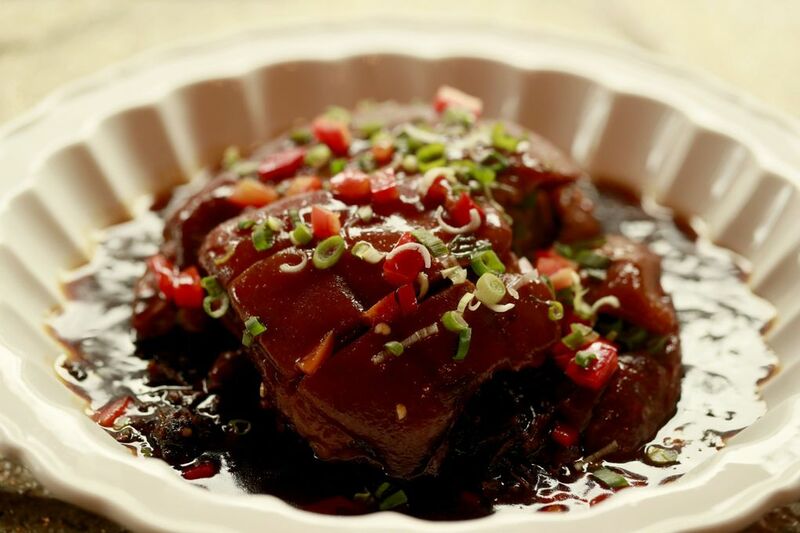 Doubanjiang (fermented bean paste) is the foundation of the sauces, which go from tame (Chinese BBQ) to nuanced, numbing “mala” heat, to the hard-pounding chili heat of “spicy.” Garlic sauce is a good middle-of-the-road choice. Keeping the pot vegetarian is no problem. Noodles, tofu, mushrooms and vegetables comprise most of the 40-plus possible add-ins. Each costs from one to four dollars more. Consider lotus and taro root, celtuce (a thick-stemmed Chinese lettuce) and konjak (a yam-like bulbotuber), all of which contribute interesting texture to the scrum. The dry pots are a meal in themselves, but don’t overlook the menu’s back pages, devoted to dozens of Hunan specialties. 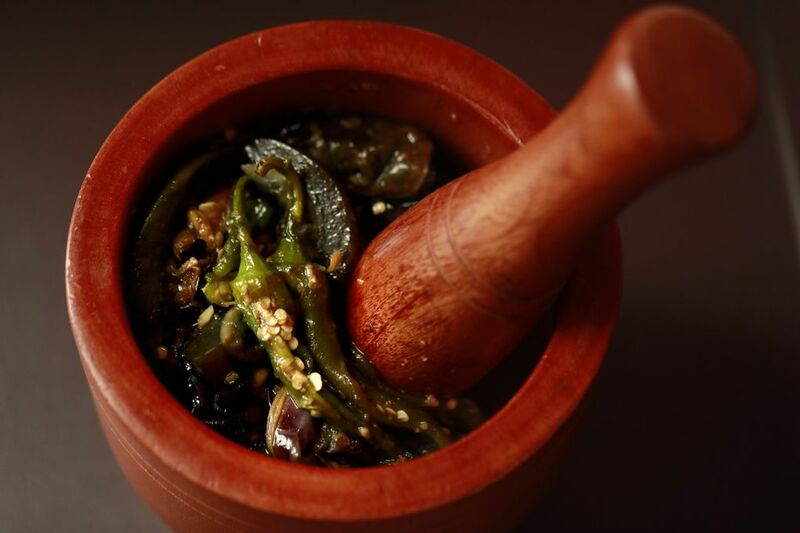 The one dish not to miss combines eggplant, preserved eggs and long, whole, sweet green peppers in a giant, wooden mortar and pestle. It’s up to you to pound the mixture at the table to your desired texture. (“Chinese guacamole,” quipped one of my dining companions.) The ingredients are soft to begin with, but mashing breaks them down further and helps distribute the flavors, especially the pungent, blackened egg, cured in clay, ash and salt. I loved it. Braised ham hock is even earthier. The hock is the part of the leg between the ham proper and the pig’s trotter. Made of skin, tendon and ligaments, it requires lengthy stewing, which it clearly gets here. The result is an incredible hulk of soft skin and yielding meat that needs just a nudge with chopsticks to separate from the bone. Combined with a dark, briny, soy-based sauce and shreds of fermented mustard cabbage (gai choy), it’s a rustic, muscularly flavored dish. On the lighter side, Chinese cauliflower is pan-fried to tender crispness with a little bit of pork belly and a lot of red chili peppers. They use a type of cauliflower that I’d not seen before called taishan. The pale, spindly trees, tinged with green, look and taste like a cross between broccoli and cauliflower. Luffa was also new to me. It’s a skinny squash that resembles okra in its whole, raw form, but tastes a little like cucumber when cooked. Ribbons of it floated in a sunny shellfish broth loaded with ginger, scallion, garlic and many tiny clams. Clam soup with luffa is now my new favorite cold remedy. The kitchens are in the hands of experts. Chef Yu Xiang, formerly the chef/proprietor of three Hunan restaurants in Shenzhen, Canton province, oversees the Bellevue location. Chef Jian Yang, SPK’s co-founder and head chef for more than a decade at Changsha Huatian Hotel in Hunan Province, heads the Seattle kitchen. 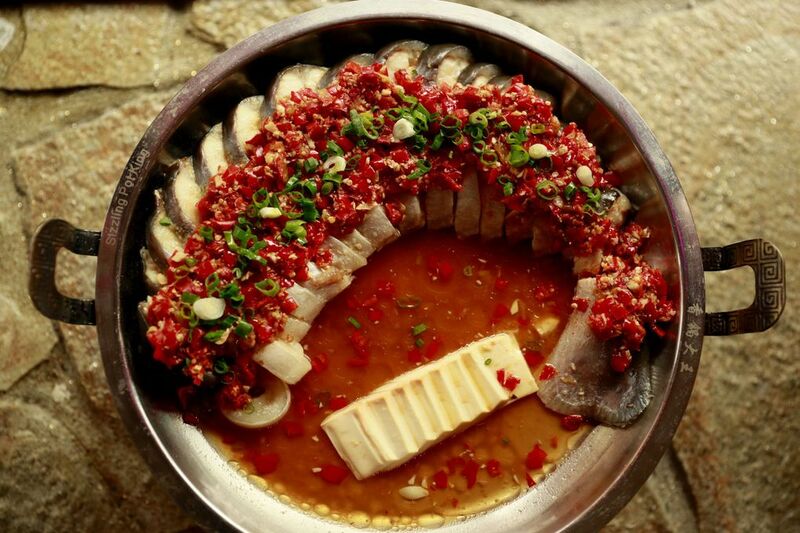 Hunan is one of eight important culinary traditions of modern China, along with Anhui, Cantonese, Fujian, Jiangsu, Shandong, Sichuan and Zhejiang. It’s becoming more available in and around Seattle. In addition to SPK, another growing chain, Dong Ting Chun, has added outposts in Edmonds and Redmond to its string of stores in California and Las Vegas. Three visits could not begin to make a dent in all that Sizzling Pot King offers. I plan to keep exploring and I encourage you to as well.